A cool gray misty morning greeted 21 riders on the 160 km at 5 AM, and 18 senior riders and 28 Junior riders on the 120 km at 6 AM, 23 riders on the 80 km (3 Juniors) at 7 AM, 11 riders on the 60 km at 8 AM, and also 12 riders on a 39 km ride ? enough to keep any of the veterinarians and stewards very busy! While out shooting on the course, I ran into photogapher and journalist Heidi Bernsdorff and her friend Innes, who swept me into their car and around to some good photo sites with them. While waiting between riders, we talked about German endurance, which is still a good ways behind the French. 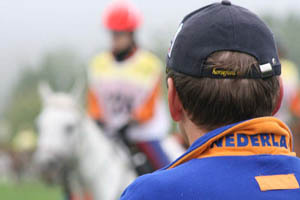 While the Germans have a history and foundation of show jumping and dressage, (where the money is), and therefore much international success in those disciplines, endurance has long been looked down on by those sports. In France it's the opposite ? 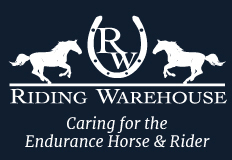 they've got the basis for endurance, and therefore much success in the sport, and not so much dressage and show jumping ? but the French have made endurance work very well. Endurance in Germany is becoming a little more accepted now ? it's not all just about a bunch of yayhoo cowboys getting on horses and galloping all day long ? 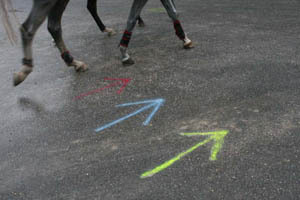 but it still has a ways to go to attract sponsorship and to produce the numbers of top riders and top horses. 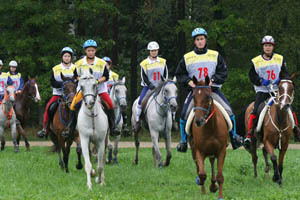 ?The endurance sport is still a very little child in Germany,? 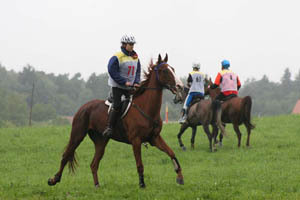 says German endurance mom Jutta Ziehm-Weigel. But really, you shouldn't look down on another discipline until you've tried it and can really make an informed opinion. ?I'd like to see a show jumper ride an Arabian 160 km, and then i'd like to see him AFTER the ride,? said Heidi. The same rule applies to human beings and other countries, we agreed: you shouldn't look down on them until you know them. You might just learn something from them and what they do. The skies remained gray and heavy all day after yesterday's rather heavy rains, but it actually only rained a minimal amount, and it made for cooler and kinder temperatures for the horses. It did, however make for slippery conditions out on the course. Throughout the loops on the course, the French teams and riders made a pretty picture, often riding together in a big group, like the cavalry riding in formation. It certainly helped contribute to their success: the French dominated the top spots in the 120 km Junior ride (taking 6 of the top 7 places), and 3 of the top 4 in the 160 km. The only ride they didn't conquer, the Open 120 km ride, was because they didn't have any riders entered! 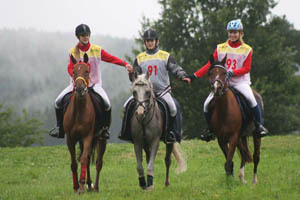 Germans swept the finish of the Open 80 km ride, with Sybille Baumer-Fischer on Garibha crossing the finish line 3 minutes ahead of a sprinting Astrid Gotz and Susanne Guldenpfennig-Hinrichs. Carla Romer from The Netherlands finished in fourth but had a tough break when her mare Fadilah R vetted out lame at the finish. That knocks her out of the European Championships in Portugal in September. Slovakian riders Feiruz Boulbolova and Feras Boulbol rode and finished together in 5th and 6th; the lone Polish rider of the day in Kreuth, Artur Landau, finished in 7th on his beautiful gray stallion Hint, much to the cheers of his Polish support team. Ingrid Langen from The Netherlands finished 13th on her gelding Amorin Star. 14 of 20 riders finished, with the winner averaging 16.5 km/hr, a good speed on a hilly, wet course. Two of 3 Juniors completed the 80 km Junior ride, with Stephanie Schrumpf beating Jasmin Hacker. The 120 km Open ride was a truly international finish, with Switzerland's Sandra Bechter finishing just minutes ahead of Klaudia Al Samarraie of Germany, followed by Italy's Simone Di Battista, Netherlands' Jannet Van Wijk, and Austria's Alexandra Engleder. Waiting anxiously at the finish line for Jannet was her husband Marc. He said ?Jannet said she was going to take it easy on this last loop, and now I'm worrying about where she is!? He didn't have to worry, because Jannet rode smart, pacing well and averaging 14.8 km/hr (the winner averaged 16.3) with her horse Latino, which resulted in Latino taking home the Best Conditioned honors next day at the Awards presentation. That duo will be in the European Championships in Portugal in 4 weeks' time. Twelve of 18 starters finished. Twenty of 28 finished the 120 km Junior ride. The French-dominated ride was won by Nina Lissarrague in a race for the finish over Anne Charlotte. Lisa Riou just beat Clementine Manoha for 3rd, with Italian rider Maria Teresa Felice coming in 5th just a few seconds behind them. Prince Khalid Bin Ghalib Al Said finished 8th on Buddy D, one of 3 horses from Jutta Schultheis' stables. He was only 10 minutes behind the winner. 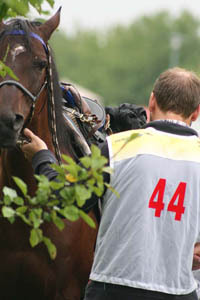 Netherlands rider Jarmila Lakeman finished 14th on the Lamsma's gelding Sattarov. ?He's a good junior's horse,? said Anita Lamsma, owner of Sattarov. ?He just goes along and does whatever you ask of him. If you want to go faster, he'll go faster. If you want him to slow down, he'll slow down. If you want him to follow a group, or go off by himself, he'll do that, too. He just wants to please his rider.? 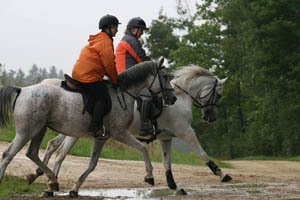 And Jarmila gets along well with him, and is a good rider. ?She feels the horse that she rides, does what the horse needs. If the horse feels tired, or hot, she'll slow down for him, and if he gets better and is ready to go faster, then she goes faster. She doesn't care where she finishes, she just does what's best for the horse. She's only 18, so she's going to be a good rider.? Jarmila said it was a difficult course, for the wet conditions. ?There were lots of ups and downs, some of them steep, and very slippery, and lots of stones.? The overcast misty weather undoubtedly contributed to the fewer number of metabolic pulls, however. 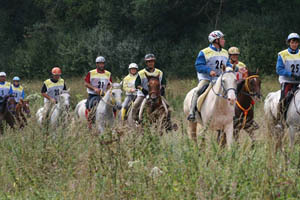 Of the 21 starters in the 160 km ride, 13 finished, with, again, France coming out on top, with Vincent Dupont riding Ulysse De Suleiman, at an average speed of 16.4 km/hr. He also received Best Conditioned honors the next morning on a very fit and sound horse. 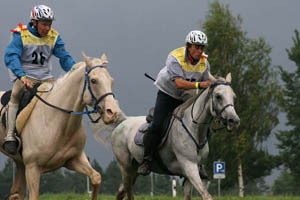 He was two minutes ahead of the next two finishers, France's Lucovic Saroul, on a big striking cremello light-eyed gelding Illoco Eldrocol, thundering down the grassy finishing stretch with Italy's Andrea Iacchelli on a gray mare Djamina. Saroul just nosed out Iacchelli for second. Following them were France's Guy Dumas, Germany's Sabrina Arnold, France's Barbara Lissarrague, Netherlands' Yvonne Van Der Velde, and France's Stephane Chazel. Finishing 9th, with the biggest rooting section of the entire weekend, was the Hungarian rider Jozsef Toth on the Shagya Arabian O Bajan Facer. His team was waiting at the finish line with the Hungarian flag and a bottle of champagne ready to pop. They started cheering the instant the top button of Jozsef's cap first appeared on the horizon, and after he cantered across the finish line, they ran after him waving the flag and the champagne bottle all the way to the vet ring. I could hear the cheer in the vet ring when he passed all the way down at the finish line. 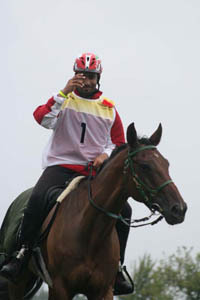 Prince Loay Bin Ghalib Al Said finished 11th, tipping his hat to the cheers as he crossed the finish line on that big beautiful Anglo Arabian Hedgard. The horse may be big for endurance, but he added another successful 160 km finish to his equine CV. 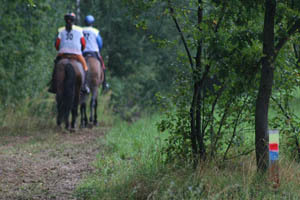 Though Austrian Renate Lang retired her mare after 90 km at vet gate 3 (?She just wasn't going right? 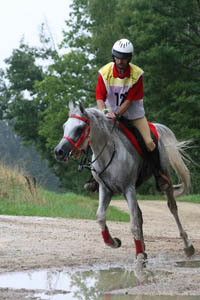 ), Austrian Karin Eisl came through, finishing 2 minutes after the Prince in 12th place on her gelding Farino De Montagna. Great Britain's Anna Williams on HS Saboteur was the final horse to finish just after 8 PM, with an average speed of 13.7 km/hr. Italy's Fausto Fiorruci had been riding on or near the lead for the first 90 km, until his mare Veronica Cap vetted out lame at the 4th vet gate. The 60 km ride finished 8 riders from 11 starters. Germany swept the podium honors, with Ulrike Von Wardenburg finishing just seconds ahead of Sonja Buluschek, who was 11 minutes ahead of Michaela Barz. Just a second behind her was Oman's Prince Ahmed Bin Ghalib Al Said ? a 3 for 3 finish (in the 60, 120, and 160 km rides) for the visiting Princes of Oman. The Awards presentation held the next morning was a big affair, with almost all the riders who finished in all the rides riding their horses into the arena (some were led on foot), and lining up around the arena. Almost all were dressed in pristine white riding pants ? a nice presentation for the spectators, and a nice close to the weekend. 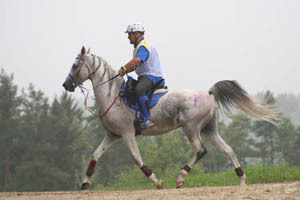 ZSAA president, and Organisor extraordinaire of Kreuth, Ahmed Al Samarraie, and a host of veterinarians, stewards, ground jury, secretaries, assistants, and volunteers succeeded in putting on a very successful ride in a beautiful setting. Mark your calendar for August next year!